Caught in the rain in Rome last month, I wandered into the Palazzo Barberini, one of the homes of Italy's National Gallery of Ancient Art. Tired, and with sore feet, I was more interested that afternoon in the cafe than the art. But the cafe was closed and the galleries open, and I ended up staying far longer than I realised, transfixed by the faces on the walls. The Barberini has a Caravaggio in which Judith is carving the head off Holofernes (he deserved it) as an old woman looks on. Judith is the centre of attention, but it is the old woman who stays with you. Character is in every line of her face, and although the woman who posed for it must have died about 400 years ago, you wouldn't be surprised if she stepped out of the canvas to confront you, so alive is she in paint. The other painting that caught my eye was a portrait: one of Hans Holbein's of Henry VIII. This isn't the Henry so sexily overacted by Jonathan Rhys Meyers in The Tudors but a fat redhead with piggy eyes and an expression that exudes uncompromising power. I had an uncanny sense that, just as I was standing to look at the portrait, so too would Henry have stood - patiently or impatiently? - while his likeness was taken by Holbein. I felt a strange sort of connection through time. Portraits give us that connection - an incredible eye into history - but there is an odd paradox. In art museums we spend more time looking at paintings of people than at any others, but at auction it is the paintings without people in them - landscapes, still lifes and so on - that fetch the most money. There seems to be something remarkably unfashionable about portraits these days, despite the fact that, as gallery visitors prove, we really like them. But if portraits give us such an eye into history, what sort of an eye will they be providing into today's society? Conor Walton, who paints portraits, among other subjects, says that because of the time and money involved, a lot of commissioned portraits these days are of people retiring from positions of relative power. Does this mean that future generations will find an Ireland consisting mainly of grey-haired men hanging on their museum walls? Unfortunately, yes. And that's a shame, because as a new book, The Society Portrait , shows, commissioned portraits do more than simply depict their sitters; they create windows into those people's worlds, their lives, their aspirations, and say something about their characters. The world depicted in The Society Portrait is of a Europe thick with princes and princesses, Russians with improbable-sounding titles, dukes, duchesses and wealthy Americans marrying into a society they would never otherwise be allowed to join. Its pages are populated with people idling away their lives, as well as those pivotal to political, social and cultural history. 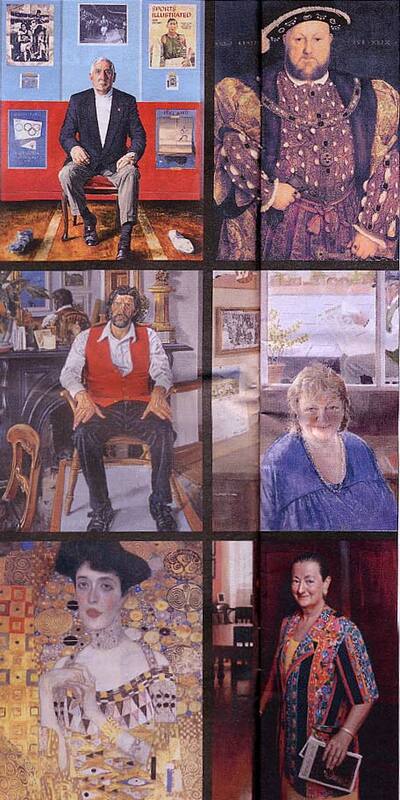 Flicking through it, I start to wonder whom I would like to have paint me. If I could choose anyone in art history, whom would it be? I don't think I'm tough enough to suit Holbein, even though his portrait of Anne of Cleeves was said to be so flattering that Henry VIII felt he'd been cheated when he met the real thing. Van Dyck was another flatterer. His painting of Queen Henrietta Maria had her niece thinking she was beautiful - until she met her in the flesh and discovered "a small woman with long, thin arms, a stooped back and teeth jutting from her mouth like cannon through a loophole". Klimt's flower women, with their swirling golds, are beautiful but not quite the "me" I'd like to be in a portrait, and I think I'm a bit too short to be an Ingres. The question of whom you would like to paint you becomes a question of how you would like to see yourself. In the end I'd rather like to have been a William Orpen - although he did have a habit of falling in love with his sitters - or perhaps a Whistler. Whistler's women can be a bit chocolate-boxy, in that they are almost overly pretty, and a bit ethereal, but, as I think about it, overly pretty is something I'd rather like to be. And that's the issue that makes contemporary portraits so difficult and different, because since the avant-garde movement, when the direction of art changed, you can't just go around telling an artist what to paint. To the contemporary artist, the idea of making a flattering likeness runs counter to the notion of the artist's creative independence. The artists who do negotiate this issue, however, create memorable images that should stand art's most important test, which is that of time. Walton describes the process. "Sometimes the sitter is satisfied simply with a good likeness and wants to stop as soon as this has been achieved, but there's vastly more to a good painting than merely a good likeness. Often, you have to undo the likeness or play rough with the paint, in order to push the picture forward, and sitters invariably think you're ruining their portrait at that point and want you to stop," he says. "It can take a real effort of will not to leave it there and keep pushing on." James Hanley, who is commissioned for "at least the next two years" on portraits, agrees that most commissions are of men of a certain age, but he points out the longevity of portraits. "A lot of modern and contemporary art is dating very badly already, but a really good portrait will stand the test of time." He also points out that institutions such as Alexandra College, which, through a commitment to commissioning the best artists of the time to paint its heads, now has an incredible lineage to show. Hanley is one of the artists in the National Gallery of Ireland's National Portrait Collection - he painted Ronnie Delany - which is being added to with commissions by the Irish Life & Permanent Portrait Series. The series began in 1998 with Mark Shields's painting of Mary and Nicholas Robinson, and there are just six in it so far. Gillian Bowler, the chairwoman of Irish Life, describes the series as "a rich cultural legacy", and it is very worthwhile, but there's still no denying that the legacy we're creating is a little too thin. Some really good artists are working in the area - Shields, Mick O'Dea, Oisín Roche, Maeve McCarthy, Una Sealy and Carey Clarke, for example. There are also artists, such as Nick Miller, who undertake portraits from time to time, although Miller says he takes them on only rarely. "Most people," he says, "who want to commission a portrait already have something fixed in the mind, and it's hard to meet that expectation. They have to know my work and want it to be a painting more than a portrait. In those circumstances I will consider a commission." Commissioning a portrait is a commitment in terms of time and money. Cost can be about €10,000, and, waiting lists apart, there is the time involved in sittings, and the months it can take to complete a painting. Walton needs a minimum of five sittings. "Life is fast these days," he says, "and this is one thing that doesn't fit into that." Many dismiss as vain the idea of having their portrait painted before they reach retirement age. But we live in an era when entire lives are posted on sites such as Facebook and when every movement is documented in photographs and on video. Portrait painting is slower; it's about future histories as well as about harking back to the past. It's also about trusting an artist to find something in you that you might like to see on canvas. A price tag of €10,000 might seem a lot of money, but it's not as much as the new cars that will be on lots of shopping lists as the year turns. If the amazing legacy that The Society Portrait shows us is to continue, we'll have to commit to it. Otherwise future generations won't have the true colours of Irish life on their walls; there'll just be a lot of grey-haired old men staring down at our great-grandchildren.